When I was at my old job, my office manager asked if I wanted to help her with a little craft project. (Given that I spent the of majority of my workday buried in Excel, this was a welcomed surprise.) She wanted a little letter/mail box for people to write thank you cards or nice notes to other people in the office, and my mind was of course running with ideas within the first 30 seconds of her coming up to me. After some quick Google and Pinterest searches, I knew I wanted to make an old-fashioned style mailbox, like this. I'll say now that this is a super crafty project - reusing a shoe box really made me feel like I was back in third grade. But it turned out really cute, and I can totally see it as a wedding guest note box, valentines box or suggestions box! *Ideally, your shoe box will have an attached top (as opposed to a separate bottom and lid), as well as a flap closure of some sort. This makes it a little more functional as a letter box. You can totally still use a shoe box that doesn't have either of those two things, but you may need to make a few modifications! Cut the slot for letters in your box. Using your ruler, measure and trace a 8" x 1" rectangular slot in the center of your box, about 3-4 inches from the top of the box. Trace over your rectangle with the blade tip of your scissors, applying enough pressure to cut through almost half the thickness of your cardboard. Now cut the rectangle completely, either by applying full pressure to cut straight through the cardboard or by using your scissors to snip the rectangle out.n discard the rectangle. Cut your scrap cardboard into the proper shape for the roof that hangs over the letter slot. First, cut a rectangle about 9" x 1.5" - about 0.25" wider than the dimensions of your box on each side. Then cut two triangles using the diagram below. Cut your scrap cardboard into ~0.5" strips to form the detail below the letter slot. Once the primer is dry, paint two or three layers of paint for your base color. I only painted sides that would be visible, but feel free to paint the entire box if you want. If you paint trim on directly, put painter's tape on your box top ensure clean edges, and then paint the trim paint in several coats. One dry, remove the painters tape. To paint paper trim that you will glue on, first paint the paper. Wrapping paper or similar paper works best here because it won't get soggy or wrinkled from the paint. Once dry, cut into strips that are as long as the dimensions of your box (length, height, width) about 1.25 inches wide. I put trim on my slot edges because they were rough- definitely optional, so if you do what I did, don't forget to cut trim for tour letter slot! For each strip of trim, use your glue stick to convert the entire backside of the trim, and carefully press the trim onto the edge of your box, making sure you're pressing evenly on both sides of the corner and that the trim edge is straight on both sides. Use your hot glue gun to first glue the 3 roof pieces together. Let cool. Glue on the 4 cardboard strips for the frame into a rectangle, centered between the letter slot and bottom of your box. 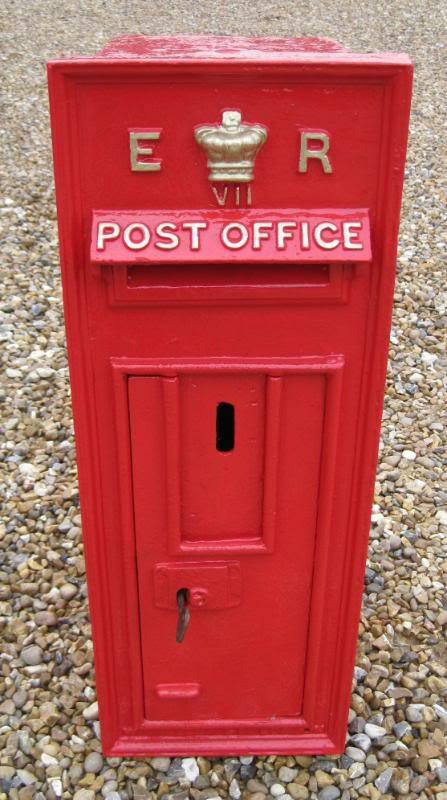 Paint the letter print onto your letter box using the same color as your trim. I painted my typeface by hand, but if you need to, lightly trace the letters with pencil first to avoid mistakes, or use a stencil. You also can have some comfort in the fact that if you really mess up, you can cover up the mistake by painting over it with your base color (which I did at least twice). While I wrote "LETTERS" and "SAMAPOST" (my old company was Samasource, if you're wondering), you can definitely customize the print based on what you'll actually use the box for. Step 6. Glue the roof onto the shoebox. Step 6. Glue the frame on. Now admire your work, and get people to write you love notes, thank yous, and all kinds of snail mail!